Try dining out this Thanksgiving...or better yet, ordering in! Turkey Day is fast approaching and not all of us have the time (or patience) to cook a big, fabulous meal. Luckily, there's an easy solution - have it made for you! We have made it easy for you to enjoy your Thanksgiving dinner with these TOP 10 Places To Pick Up Thanksgiving in Macon. If you're new to town or haven't gotten a chance to eat at Piedmont Brewery & Kitchen, you have stop by and pick up their amazing food this Thanksgiving holiday! Orders will be accepted until 10:30pm on Saturday, November 17th. Their name might same ham, but most Maconites agree that there is no place better than Honeybaked Ham for all of your holiday meats. Pick from whole turkeys, turkey breasts or get wild with their grand gathering special. Got a large crew? Try their Ham and turkey bundle. Picking up a couple sides or desserts goes a long way from having thanksgiving disaster to thanksgiving bliss. Pick up their sweet potato puffs, cornbread dressing or pecan pie. Pre-order available until the 19th, but to be safe call in or shop online today to secure your goodies! The Fresh Market has everything you need to put together a great Thanksgiving meal. From the complete traditional holiday meal package that includes the Turkey and all your favorite side items to a whole variety of options to augment your own holiday meal, Fresh Market has got you covered. If you want to order the complete meal package you have to hurry deadline is this week. Of course, if you just want to add some items to your own meal Fresh Market is open right up until Thanksgiving day for last minute needs. Since 1993, the Casserole Shop has proudly offered Macon and Middle Georgia delicious, high-quality comfort food in the form of our delectable casseroles, appetizers, side dishes, breads and bakery items. Your family and dinner guests will be pleased with a satisfying meal, and you'll be pleased with the easy clean-up afterwards! Hurry on down to the Casserole Shop, where they are happy to make homemade meals for busy people like you! Reserve your Thanksgiving desserts soon! Take home their hot and ready to eat traditional Thanksgiving dinner. 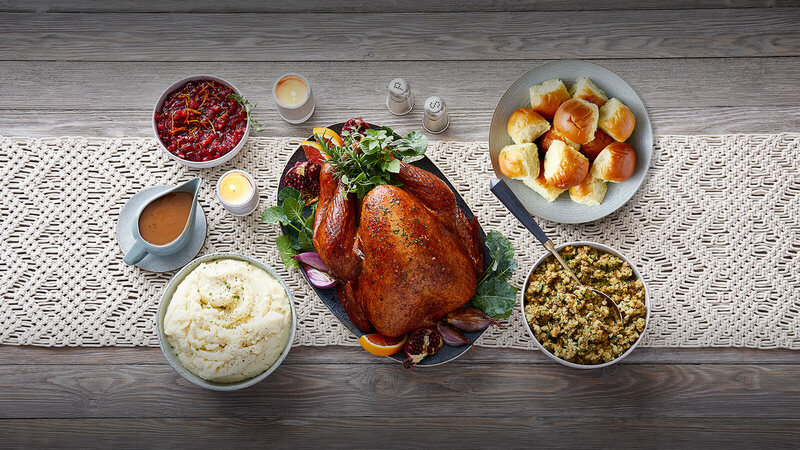 Fill your day with family and your table with our Turkey n’ Dressing dinner complete with Gravy, a sampling of Sugar Cured Ham, choice of three quart-sized country sides, Cranberry Relish, Biscuits, Corn Muffins, or a loaf of Sourdough Bread. Homestyle Turkey n’ Dressing Family Meal To-Go does not include beverages or pie. They do Thanksgiving Turkey, Casseroles and Desserts. Which is great if you don’t want to dirty your own kitchen, you can let them do all the turkey and all the sides or you can pick up a side or dessert if you’re going to someone else’s house for the holiday. They have a huge assortment of sides from FOJ House Jalapeno Cornbread Muffins to the Bourbon Chocolate Pecan Pie. What’s great about FOJ is they have desserts too! I bet if you talk nice they will make you a pan of those amazing blondies, the whole family won’t even care who made the turkey after one bite into one of those square pieces of heaven. Remember you have to order in early! It’s hard not to love Fresh Air Barbecue, and we have a feeling we aren’t the only ones. Many middle Ga families have made a tradition out of picking up their holiday meats from Fresh Air. They have smoked turkeys, hams and Boston butts ready for your thanksgiving meal. The difference from fresh air and all the others is their old fashioned wood burning pit and the long tradition of amazing eats. But if you want a fresh air meat on your table – Call Right Now! Seriously- Right Now! Preorder Ends: Soon! In addition to their full service catering services Grow is offering some awesome dishes to round out your Thanksgiving meal. Grow will be open on Thanksgiving Day and will take care of the ham and turkey, dressing and sides. Call ahead to make your reservations for Thanksgiving now! Let S&S Cafeteria save you from making Thanksgiving dinner yourself and pre-order your lunch or dinner options for this year's Thanksgiving table! Choose from 13 different entrées including: Roast Beef, Fried Chicken, Country Steak and Oven-roasted Chicken. Complete your meal by choosing from our wide-range of delicious vegetables, cool, crisp salads, oven-baked breads, signature cakes and pies, and fresh-brewed sweet or unsweet tea. You haven’t had delicious southern barbecue until you’ve had Fincher's. For over 75 years, Fincher's has been teasing taste buds with their pit-cooked pork, sandwiches, and more. Pre-order shoulders, butts, turkeys and ham now for Thanksgiving. Last day for pre-orders: Monday, November 19th.